Muhsin Khan O mankind! Fear your Lord and be dutiful to Him! Verily, the earthquake of the Hour (of Judgement) is a terrible thing. Pickthall O mankind! Fear your Lord. Lo! the earthquake of the Hour (of Doom) is a tremendous thing. Muhsin Khan The Day you shall see it, every nursing mother will forget her nursling, and every pregnant one will drop her load, and you shall see mankind as in a drunken state, yet they will not be drunken, but severe will be the Torment of Allah. Pickthall On the day when ye behold it, every nursing mother will forget her nursling and every pregnant one will be delivered of her burden, and thou (Muhammad) wilt see mankind as drunken, yet they will not be drunken, but the Doom of Allah will be strong (upon them). Muhsin Khan And among mankind is he who disputes concerning Allah, without knowledge, and follows every rebellious (disobedient to Allah) Shaitan (devil) (devoid of each and every kind of good). Pickthall For him it is decreed that whoso taketh him for friend, he verily will mislead him and will guide him to the punishment of the Flame. Muhsin Khan O mankind! If you are in doubt about the Resurrection, then verily! We have created you (i.e. Adam) from dust, then from a Nutfah (mixed drops of male and female sexual discharge i.e. offspring of Adam), then from a clot (a piece of thick coagulated blood) then from a little lump of flesh, some formed and some unformed (miscarriage), that We may make (it) clear to you (i.e. to show you Our Power and Ability to do what We will). And We cause whom We will to remain in the wombs for an appointed term, then We bring you out as infants, then (give you growth) that you may reach your age of full strength. And among you there is he who dies (young), and among you there is he who is brought back to the miserable old age, so that he knows nothing after having known. And you see the earth barren, but when We send down water (rain) on it, it is stirred (to life), it swells and puts forth every lovely kind (of growth). Pickthall O mankind! if ye are in doubt concerning the Resurrection, then lo! We have created you from dust, then from a drop of seed, then from a clot, then from a little lump of flesh shapely and shapeless, that We may make (it) clear for you. And We cause what We will to remain in the wombs for an appointed time, and afterward We bring you forth as infants, then (give you growth) that ye attain your full strength. And among you there is he who dieth (young), and among you there is he who is brought back to the most abject time of life, so that, after knowledge, he knoweth naught. And thou (Muhammad) seest the earth barren, but when We send down water thereon, it doth thrill and swell and put forth every lovely kind (of growth). Muhsin Khan That is because Allah, He is the Truth, and it is He Who gives life to the dead, and it is He Who is Able to do all things. Muhsin Khan And surely, the Hour is coming, there is no doubt about it, and certainly, Allah will resurrect those who are in the graves. Pickthall And because the Hour will come, there is no doubt thereof; and because Allah will raise those who are in the graves. Muhsin Khan Bending his neck in pride (far astray from the Path of Allah), and leading (others) too (far) astray from the Path of Allah. For him there is disgrace in this worldly life, and on the Day of Resurrection We shall make him taste the torment of burning (Fire). Pickthall Turning away in pride to beguile (men) from the way of Allah. For him in this world is ignominy, and on the Day of Resurrection We make him taste the doom of burning. Muhsin Khan That is because of what your hands have sent forth, and verily, Allah is not unjust to (His) slaves. Pickthall (And unto him it will be said): This is for that which thy two hands have sent before, and because Allah is no oppressor of His slaves. Muhsin Khan And among mankind is he who worships Allah as it were, upon the very edge (i.e. in doubt); if good befalls him, he is content therewith; but if a trial befalls him, he turns back on his face (i.e. reverts back to disbelief after embracing Islam). He loses both this world and the Hereafter. That is the evident loss. Pickthall And among mankind is he who worshippeth Allah upon a narrow marge so that if good befalleth him he is content therewith, but if a trial befalleth him, he falleth away utterly. He loseth both the world and the Hereafter. That is the sheer loss. Muhsin Khan He calls besides Allah unto that which hurts him not, nor profits him. That is a straying far away. Pickthall He calleth, beside Allah, unto that which hurteth him not nor benefiteth him. That is the far error. Muhsin Khan He calls unto him whose harm is nearer than his profit; certainly, and evil Maula (patron) and certainly an evil friend! Pickthall He calleth unto him whose harm is nearer than his benefit; verily an evil patron and verily an evil friend! Muhsin Khan Truly, Allah will admit those who believe (in Islamic Monotheism) and do righteous good deeds (according to the Quran and the Sunnah) to Gardens underneath which rivers flow (in Paradise). Verily, Allah does what He wills. Pickthall Lo! Allah causeth those who believe and do good works to enter Gardens underneath which rivers flow. Lo! Allah doth what He intendeth. Muhsin Khan Whoever thinks that Allah will not help him (Muhammad SAW) in this world and in the Hereafter, let him stretch out a rope to the ceiling and let him strangle himself. Then let him see whether his plan will remove that whereat he rages! Pickthall Whoso is wont to think (through envy) that Allah will not give him (Muhammad) victory in the world and the Hereafter (and is enraged at the thought of his victory), let him stretch a rope up to the roof (of his dwelling), and let him hang himself. Then let him see whether his strategy dispelleth that whereat he rageth!. Muhsin Khan Thus have We sent it (this Quran) down (to Muhammad SAW) as clear signs, evidences and proofs, and surely, Allah guides whom He wills. Pickthall Thus We reveal it as plain revelations, and verily Allah guideth whom He will. Muhsin Khan Verily, those who believe (in Allah and in His Messenger Muhammad SAW), and those who are Jews, and the Sabians, and the Christians, and the Magians, and those who worship others besides Allah, truly, Allah will judge between them on the Day of Resurrection. Verily! Allah is Witness over all things. Pickthall Lo! those who believe (this revelation), and those who are Jews, and the Sabaeans and the Christians and the Magians and the idolaters - Lo! Allah will decide between them on the Day of Resurrection. Lo! Allah is Witness over all things. Muhsin Khan See you not that to Allah prostrates whoever is in the heavens and whoever is on the earth, and the sun, and the moon, and the stars, and the mountains, and the trees, and Ad-Dawab (moving living creatures, beasts, etc. ), and many of mankind? But there are many (men) on whom the punishment is justified. And whomsoever Allah disgraces, none can honour him. Verily! Allah does what He wills. Pickthall Hast thou not seen that unto Allah payeth adoration whosoever is in the heavens and whosoever is in the earth, and the sun, and the moon, and the stars, and the hills, and the trees, and the beasts, and many of mankind, while there are many unto whom the doom is justly due. He whom Allah scorneth, there is none to give him honour. Lo! Allah doeth what He will. Muhsin Khan These two opponents (believers and disbelievers) dispute with each other about their Lord; then as for those who disbelieve, garments of fire will be cut out for them, boiling water will be poured down over their heads. Muhsin Khan With it will melt or vanish away what is within their bellies, as well as (their) skins. Muhsin Khan And for them are hooked rods of iron (to punish them). Muhsin Khan Every time they seek to get away therefrom, from anguish, they will be driven back therein, and (it will be) said to them: "Taste the torment of burning!" Pickthall Whenever, in their anguish, they would go forth from thence they are driven back therein and (it is said unto them): Taste the doom of burning. Muhsin Khan Truly, Allah will admit those who believe (in the Oneness of Allah Islamic Monotheism) and do righteous good deeds, to Gardens underneath which rivers flow (in Paradise), wherein they will be adorned with bracelets of gold and pearls and their garments therein will be of silk. Pickthall Lo! Allah will cause those who believe and do good works to enter Gardens underneath which rivers flow, wherein they will be allowed armlets of gold, and pearls, and their raiment therein will be silk. Muhsin Khan And they are guided (in this world) unto goodly speech (i.e. La ilaha ill-Allah, Alhamdu lillah, recitation of the Quran, etc.) and they are guided to the Path of Him (i.e. Allah's Religion of Islamic Monotheism), Who is Worthy of all praises. Pickthall They are guided unto gentle speech; they are guided unto the path of the Glorious One. Muhsin Khan Verily! Those who disbelieve and hinder (men) from the Path of Allah, and from Al-Masjid-al-Haram (at Makkah) which We have made (open) to (all) men, the dweller in it and the visitor from the country are equal there [as regards its sanctity and pilgrimage (Hajj and 'Umrah)]. And whoever inclines to evil actions therein or to do wrong (i.e. practise polytheism and leave Islamic Monotheism), him We shall cause to taste a painful torment. Pickthall Lo! those who disbelieve and bar (men) from the way of Allah and from the Inviolable Place of Worship, which We have appointed for mankind together, the dweller therein and the nomad: whosoever seeketh wrongful partiality therein, him We shall cause to taste a painful doom. Muhsin Khan And (remember) when We showed Ibrahim (Abraham) the site of the (Sacred) House (the Ka'bah at Makkah) (saying): "Associate not anything (in worship) with Me, [La ilaha ill-Allah (none has the right to be worshipped but Allah Islamic Monotheism], and sanctify My House for those who circumambulate it, and those who stand up for prayer, and those who bow (submit themselves with humility and obedience to Allah), and make prostration (in prayer, etc. );"
Pickthall And (remember) when We prepared for Abraham the place of the (holy) House, saying: Ascribe thou no thing as partner unto Me, and purify My House for those who make the round (thereof) and those who stand and those who bow and make prostration. Muhsin Khan And proclaim to mankind the Hajj (pilgrimage). They will come to you on foot and on every lean camel, they will come from every deep and distant (wide) mountain highway (to perform Hajj). Muhsin Khan That they may witness things that are of benefit to them (i.e. reward of Hajj in the Hereafter, and also some worldly gain from trade, etc. ), and mention the Name of Allah on appointed days (i.e. 10th, 11th, 12th, and 13th day of Dhul-Hijjah), over the beast of cattle that He has provided for them (for sacrifice) (at the time of their slaughtering by saying: Bismillah, WAllahu-Akbar, Allahumma Minka wa Ilaik). Then eat thereof and feed therewith the poor who have a very hard time. Pickthall That they may witness things that are of benefit to them, and mention the name of Allah on appointed days over the beast of cattle that He hath bestowed upon them. Then eat thereof and feed therewith the poor unfortunate. Muhsin Khan Then let them complete the prescribed duties (Manasik of Hajj) for them, and perform their vows, and circumambulate the Ancient House (the Ka'bah at Makkah). Pickthall Then let them make an end of their unkemptness and pay their vows and go around the ancient House. Muhsin Khan Hunafa' Lillah (i.e. to worship none but Allah), not associating partners (in worship, etc.) unto Him and whoever assigns partners to Allah, it is as if he had fallen from the sky, and the birds had snatched him, or the wind had thrown him to a far off place. Pickthall Turning unto Allah (only), not ascribing partners unto Him; for whoso ascribeth partners unto Allah, it is as if he had fallen from the sky and the birds had snatched him or the wind had blown him to a far-off place. Muhsin Khan Thus it is [what has been mentioned in the above said Verses (27, 28, 29, 30, 31) is an obligation that mankind owes to Allah]. And whosoever honours the Symbols of Allah, then it is truly from the piety of the heart. Muhsin Khan In them (cattle offered for sacrifice) are benefits for you for an appointed term, and afterwards they are brought for sacrifice unto the ancient House (the Haram - sacred territory of Makkah city). Pickthall Therein are benefits for you for an appointed term; and afterward they are brought for sacrifice unto the ancient House. Muhsin Khan Whose hearts are filled with fear when Allah is mentioned; who patiently bear whatever may befall them (of calamities); and who perform As-Salat (Iqamat-as-Salat), and who spend (in Allah's Cause) out of what We have provided them. Pickthall Whose hearts fear when Allah is mentioned, and the patient of whatever may befall them, and those who establish worship and who spend of that We have bestowed on them. Muhsin Khan And the Budn (cows, oxen, or camels driven to be offered as sacrifices by the pilgrims at the sanctuary of Makkah.) We have made for you as among the Symbols of Allah, therein you have much good. So mention the Name of Allah over them when they are drawn up in lines (for sacrifice). Then, when they are down on their sides (after slaughter), eat thereof, and feed the beggar who does not ask (men), and the beggar who asks (men). Thus have We made them subject to you that you may be grateful. Pickthall And the camels! We have appointed them among the ceremonies of Allah. Therein ye have much good. So mention the name of Allah over them when they are drawn up in lines. Then when their flanks fall (dead), eat thereof and feed the beggar and the suppliant. Thus have We made them subject unto you, that haply ye may give thanks. Muhsin Khan It is neither their meat nor their blood that reaches Allah, but it is piety from you that reaches Him. Thus have We made them subject to you that you may magnify Allah for His Guidance to you. And give glad tidings (O Muhammad SAW) to the Muhsinun (doers of good). Pickthall Their flesh and their food reach not Allah, but the devotion from you reacheth Him. Thus have We made them subject unto you that ye may magnify Allah that He hath guided you. And give good tidings (O Muhammad) to the good. Muhsin Khan Truly, Allah defends those who believe. Verily! Allah likes not any treacherous ingrate to Allah [those who disobey Allah but obey Shaitan (Satan)]. Pickthall Lo! Allah defendeth those who are true. Lo! Allah loveth not each treacherous ingrate. Muhsin Khan Those who have been expelled from their homes unjustly only because they said: "Our Lord is Allah." - For had it not been that Allah checks one set of people by means of another, monasteries, churches, synagogues, and mosques, wherein the Name of Allah is mentioned much would surely have been pulled down. Verily, Allah will help those who help His (Cause). Truly, Allah is All-Strong, All-Mighty. Muhsin Khan Those (Muslim rulers) who, if We give them power in the land, (they) order for Iqamat-as-Salat. [i.e. to perform the five compulsory congregational Salat (prayers) (the males in mosques)], to pay the Zakat and they enjoin Al-Ma'ruf (i.e. Islamic Monotheism and all that Islam orders one to do), and forbid Al-Munkar (i.e. disbelief, polytheism and all that Islam has forbidden) [i.e. they make the Quran as the law of their country in all the spheres of life]. And with Allah rests the end of (all) matters (of creatures). Muhsin Khan And the dwellers of Madyan (Midian); and belied was Musa (Moses), but I granted respite to the disbelievers for a while, then I seized them, and how (terrible) was My Punishment (against their wrong-doing). Pickthall (And) the dwellers in Midian. And Moses was denied; but I indulged the disbelievers a long while, then I seized them, and how (terrible) was My abhorrence! Muhsin Khan And many a township have We destroyed while it was given to wrong-doing, so that it lies in ruins (up to this day), and (many) a deserted well and lofty castles! Pickthall How many a township have We destroyed while it was sinful, so that it lieth (to this day) in ruins, and (how many) a deserted well and lofty tower! Muhsin Khan Have they not travelled through the land, and have they hearts wherewith to understand and ears wherewith to hear? Verily, it is not the eyes that grow blind, but it is the hearts which are in the breasts that grow blind. Pickthall Have they not travelled in the land, and have they hearts wherewith to feel and ears wherewith to hear? For indeed it is not the eyes that grow blind, but it is the hearts, which are within the bosoms, that grow blind. Muhsin Khan And they ask you to hasten on the torment! And Allah fails not His Promise. And verily, a day with your Lord is as a thousand years of what you reckon. Pickthall And they will bid thee hasten on the Doom, and Allah faileth not His promise, but lo! a Day with Allah is as a thousand years of what ye reckon. Muhsin Khan And many a township did I give respite while it was given to wrong-doing. Then (in the end) I seized it (with punishment). And to Me is the (final) return (of all). Pickthall And how many a township did I suffer long though it was sinful! Then I grasped it. Unto Me is the return. Muhsin Khan Say (O Muhammad SAW): "O mankind! I am (sent) to you only as a plain warner." Pickthall Say: O mankind! I am only a plain warner unto you. Muhsin Khan So those who believe (in the Oneness of Allah Islamic Monotheism) and do righteous good deeds, for them is forgiveness and Rizqun Karim (generous provision, i.e. Paradise). Muhsin Khan But those who strive against Our Ayat (proofs, evidences, verses, lessons, signs, revelations, etc. ), to frustrate and obstruct them, they will be dwellers of the Hell-fire. Pickthall While those who strive to thwart Our revelations, such are rightful owners of the Fire. Muhsin Khan That He (Allah) may make what is thrown in by Shaitan (Satan) a trial for those in whose hearts is a disease (of hypocrisy and disbelief) and whose hearts are hardened. And certainly, the Zalimun (polytheists and wrong-doers, etc.) are in an opposition far-off (from the truth against Allah's Messenger and the believers). Muhsin Khan And that those who have been given knowledge may know that it (this Quran) is the truth from your Lord, and that they may believe therein, and their hearts may submit to it with humility. And verily, Allah is the Guide of those who believe, to the Straight Path. Pickthall And that those who have been given knowledge may know that it is the truth from thy Lord, so that they may believe therein and their hearts may submit humbly unto Him. Lo! Allah verily is guiding those who believe unto a right path. Muhsin Khan And those who disbelieve will not cease to be in doubt about it (this Quran) until the Hour comes suddenly upon them, or there comes to them the torment of the Day after which there will be no night (i.e. the Day of Resurrection). Pickthall And those who disbelieve will not cease to be in doubt thereof until the Hour come upon them unawares, or there come unto them the doom of a disastrous day. Muhsin Khan The sovereignty on that Day will be that of Allah (the one Who has no partners). He will judge between them. So those who believed (in the Oneness of Allah Islamic Monotheism) and did righteous good deeds will be in Gardens of delight (Paradise). Muhsin Khan And those who disbelieved and belied Our Verses (of this Quran), for them will be a humiliating torment (in Hell). Pickthall While those who disbelieved and denied Our revelations, for them will be a shameful doom. Muhsin Khan Those who emigrated in the Cause of Allah and after that were killed or died, surely, Allah will provide a good provision for them. And verily, it is Allah Who indeed is the Best of those who make provision. Pickthall Those who fled their homes for the cause of Allah and then were slain or died, Allah verily will provide for them a good provision. Lo! Allah, He verily is Best of all who make provision. Muhsin Khan Truly, He will make them enter an entrance with which they shall be well-pleased, and verily, Allah indeed is All-Knowing, Most Forbearing. Pickthall Assuredly He will cause them to enter by an entry that they will love. Lo! Allah verily is Knower, Indulgent. Muhsin Khan That is so. And whoever has retaliated with the like of that which he was made to suffer, and then has again been wronged, Allah will surely help him. Verily! Allah indeed is Oft-Pardoning, Oft-Forgiving. Pickthall That (is so). And whoso hath retaliated with the like of that which he was made to suffer and then hath (again) been wronged, Allah will succour him. Lo! Allah verily is Mild, Forgiving. Muhsin Khan That is because Allah merges the night into the day, and He merges the day into the night. And verily, Allah is All-Hearer, All-Seer. Pickthall That is because Allah maketh the night to pass into the day and maketh the day to pass into the night, and because Allah is Hearer, Seer. Muhsin Khan That is because Allah He is the Truth (the only True God of all that exists, Who has no partners or rivals with Him), and what they (the polytheists) invoke besides Him, it is Batil (falsehood) And verily, Allah He is the Most High, the Most Great. Pickthall That is because Allah, He is the True, and that whereon they call instead of Him, it is the false, and because Allah, He is the High, the Great. Muhsin Khan See you not that Allah sends down water (rain) from the sky, and then the earth becomes green? Verily, Allah is the Most Kind and Courteous, Well-Acquainted with all things. Pickthall Seest thou not how Allah sendeth down water from the sky and then the earth becometh green upon the morrow? Lo! Allah is Subtile, Aware. Muhsin Khan To Him belongs all that is in the heavens and all that is on the earth. And verily, Allah He is Rich (Free of all wants), Worthy of all praise. Pickthall Unto Him belongeth all that is in the heavens and all that is in the earth. Lo! Allah, He verily is the Absolute, the Owner of Praise. Muhsin Khan See you not that Allah has subjected to you (mankind) all that is on the earth, and the ships that sail through the sea by His Command? He withholds the heaven from falling on the earth except by His Leave. Verily, Allah is, for mankind, full of Kindness, Most Merciful. Pickthall Hast thou not seen how Allah hath made all that is in the earth subservient unto you? And the ship runneth upon the sea by His command, and He holdeth back the heaven from falling on the earth unless by His leave. Lo! Allah is, for mankind, Full of Pity, Merciful. Muhsin Khan It is He, Who gave you life, and then will cause you to die, and will again give you life (on the Day of Resurrection). Verily! Man is indeed an ingrate. Pickthall And He it is Who gave you life, then He will cause you to die, and then will give you life (again). Lo! man is verily an ingrate. Muhsin Khan For every nation We have ordained religious ceremonies [e.g. slaughtering of the beast of cattle during the three days of stay at Mina (Makkah) during the Hajj (pilgrimage)] which they must follow; so let them (pagans) not dispute with you on the matter (i.e. to eat of the cattle which you slaughter, and not to eat of cattle which Allah kills by its natural death), but invite them to your Lord. Verily! You (O Muhammad SAW) indeed are on the (true) straight guidance. (i.e. the true religion of Islamic Monotheism). Pickthall Unto each nation have We given sacred rites which they are to perform; so let them not dispute with thee of the matter, but summon thou unto thy Lord. Lo! thou indeed followest right guidance. Muhsin Khan And if they argue with you (as regards the slaughtering of the sacrifices), say; "Allah knows best of what you do. Pickthall And if they wrangle with thee, say: Allah is Best Aware of what ye do. Muhsin Khan "Allah will judge between you on the Day of Resurrection about that wherein you used to differ." Pickthall Allah will judge between you on the Day of Resurrection concerning that wherein ye used to differ. Muhsin Khan Know you not that Allah knows all that is in heaven and on earth? Verily, it is (all) in the Book (Al-Lauh Al-Mahfuz). Verily! That is easy for Allah. Pickthall Hast thou not known that Allah knoweth all that is in the heaven and the earth? Lo! it is in a record. Lo! that is easy for Allah. Muhsin Khan And they worship besides Allah others for which He has sent down no authority, and of which they have no knowledge and for the Zalimun (wrong-doers, polytheists and disbelievers in the Oneness of Allah) there is no helper. Pickthall And they worship instead of Allah that for which He hath sent down no warrant, and that whereof they have no knowledge. For evil-doers there is no helper. Muhsin Khan And when Our Clear Verses are recited to them, you will notice a denial on the faces of the disbelievers! 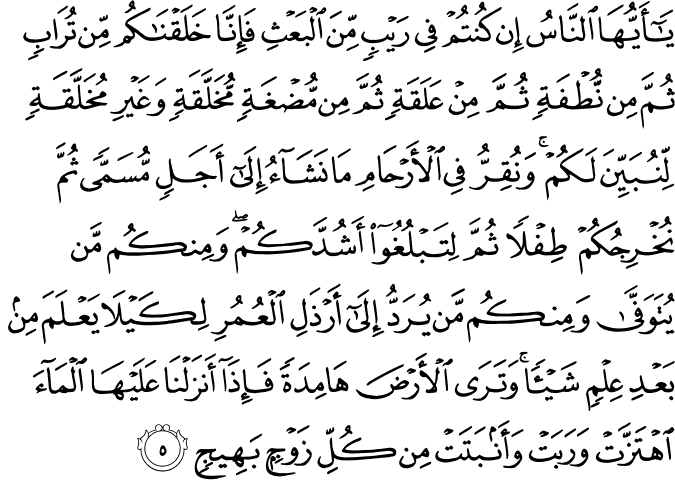 They are nearly ready to attack with violence those who recite Our Verses to them. Say: "Shall I tell you of something worse than that? The Fire (of Hell) which Allah has promised to those who disbelieve, and worst indeed is that destination!" Pickthall And when Our revelations are recited unto them, thou knowest the denial in the faces of those who disbelieve; they all but attack those who recite Our revelations unto them. Say: Shall I proclaim unto you worse than that? The Fire! Allah hath promised it for those who disbelieve. A hapless journey's end! Muhsin Khan O mankind! A similitude has been coined, so listen to it (carefully): Verily! Those on whom you call besides Allah, cannot create (even) a fly, even though they combine together for the purpose. And if the fly snatched away a thing from them, they would have no power to release it from the fly. So weak are (both) the seeker and the sought. Pickthall O mankind! A similitude is coined, so pay ye heed to it: Lo! those on whom ye call beside Allah will never create a fly though they combine together for the purpose. And if the fly took something from them, they could not rescue it from it. So weak are (both) the seeker and the sought! Muhsin Khan They have not estimated Allah His Rightful Estimate; Verily, Allah is All-Strong, All-Mighty. Pickthall They measure not Allah His rightful measure. Lo! Allah is Strong, Almighty. Muhsin Khan Allah chooses Messengers from angels and from men. Verily, Allah is All-Hearer, All-Seer. Pickthall Allah chooseth from the angels messengers, and (also) from mankind. Lo! Allah is Hearer, Seer. Muhsin Khan He knows what is before them, and what is behind them. And to Allah return all matters (for decision). Muhsin Khan O you who believe! Bow down, and prostrate yourselves, and worship your Lord and do good that you may be successful. Pickthall O ye who believe! Bow down and prostrate yourselves, and worship your Lord, and do good, that haply ye may prosper. Muhsin Khan And strive hard in Allah's Cause as you ought to strive (with sincerity and with all your efforts that His Name should be superior). He has chosen you (to convey His Message of Islamic Monotheism to mankind by inviting them to His religion, Islam), and has not laid upon you in religion any hardship, it is the religion of your father Ibrahim (Abraham) (Islamic Monotheism). It is He (Allah) Who has named you Muslims both before and in this (the Quran), that the Messenger (Muhammad SAW) may be a witness over you and you be witnesses over mankind! So perform As-Salat (Iqamat-as-Salat), give Zakat and hold fast to Allah [i.e. have confidence in Allah, and depend upon Him in all your affairs] He is your Maula (Patron, Lord, etc. ), what an Excellent Maula (Patron, Lord, etc.) and what an Excellent Helper! Pickthall And strive for Allah with the endeavour which is His right. He hath chosen you and hath not laid upon you in religion any hardship; the faith of your father Abraham (is yours). He hath named you Muslims of old time and in this (Scripture), that the messenger may be a witness against you, and that ye may be witnesses against mankind. So establish worship, pay the poor-due, and hold fast to Allah. He is your Protecting friend. A blessed Patron and a blessed Helper!